Performers include: Janet Waldo, Jackie Joseph, Barbara Pariot, Jerry Dexter, Casey Kasem, Don Messick, Cathy Douglas, Cheryl Ladd, Patrice Holloway, Sherry Alberoni, Daws Butler, Henry Corden, and John Stephenson. Based on the Archie comic book series of the same name, this animated show follows the adventures of a girl band with a knack for ending up in the center of bad guy schemes and mysteries. The band is made up of red-headed guitarist and lead vocalist Josie McCoy (Janet Waldo), bubble-headed drummer Melody Valentine (Jackie Joseph), and brainy vocalist and tambourine player Valerie Brown (Barbara Pariot). Traveling with the band are their cowardly manager Alexander Cabot III (Casey Kasem), his self-centered twin Alexandra (Sherry Alberoni), and Alexandra’s mischievous pet cat Sabastian (Don Messick). Alan M. Mayberry (Jerry Dexter) is the group’s handsome roadie and Josie’s boyfriend (though Alexandra constantly tries to steal him away). The Pussycats’ singing voices are provided by Cathy Dougher, Cheryl Ladd, and Patrice Holloway. Josie and the gang are lured by an evil countess onto a ship that is driven to her secluded island. She wants to use them as guinea pigs for her mist that causes rapid aging. Alexandra and Melody are exposed to the mist briefly but they are soon restored and are able to turn the tables and their captor. First aired: January 2, 1971. 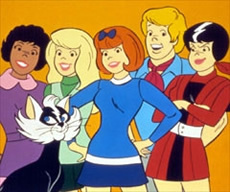 The characters returned in 1972 for a new series, Josie and the Pussycats in Outer Space. In 2001 a live-action feature film was released but it was not a success. The movie was based on the comic book version of the characters. The cast includes Rachael Leigh Cook (Josie McCoy), Tara Reid (Melody Valentine), Rosario Dawson (Valerie Brown), Gabriel Mann (Alan M.), Paulo Costanzo (Alexander Cabot), and Missi Pyle (Alexandra Cabot). Someone needs to find a way to renew Josie and the Pussycats. It was a good show. I LOVE JOSIE AND THE PUSSYCATS THAT’S MY FAVORITE CARTOON.